Irene Bobs loves fast driving. Her husband is the best car salesman in rural south eastern Australia. Together they enter the Redex Trial, a brutal race around the ancient continent, over roads no car will ever quite survive. With them is their lanky fair-haired navigator, Willie Bachhuber, a quiz show champion and failed school teacher whose job it is to call out the turns, the grids, the creek crossings on a map that will finally remove them, without warning, from the lily white Australia they all know so well. This is a thrilling high speed story that starts in one way, and then takes you some place else. It often funny, more so as the world gets stranger, and always a page-turner, even as you learn a history these characters never knew themselves. Set in the 1950’s, amongst the consequences of the age of Empires — of Kings and Queens, and subject races, of black, white and in between — this brilliantly vivid and lively novel reminds us how Europeans took possession of an ancient culture, the high purpose they invented, the crimes they committed along the way. 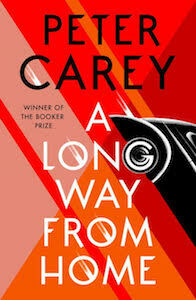 Peter Carey has twice won the Booker Prize for his explorations of Australian history. A Long Way from Home is his late style masterpiece. Website design by Jefferson Rabb.